High-tech security alarm that transforms an ordinary doorknob into a highly sensitive burglar alarm. No installation required: simply hang on the inside doorknob of any wooden door. Doorknob Safety Sensor Alarm will sound if someone even touches the door handle. Unlike other alarms, burglars will be stopped before they enter your home. Ideal accessory for students and travellers to protect hotel rooms, dorm rooms and balcony doors. See how to use MC-684 ALARM INSTRUCTIONS page. Operates on all non-metallic (wooden) doors with metal knobs. 1. In order to gain easy access to your home burglars will first try your doors to see if they are unlocked. If a burglar touches your outside doorknob this device will instantly emit a loud alarm to scare him away and alert you to the attempted entry. Even if he is wearing gloves, the alarm will sound as soon as the outside doorknob is touched. 2. Keep your children safely inside with our Safety Sensor Door Alarm. 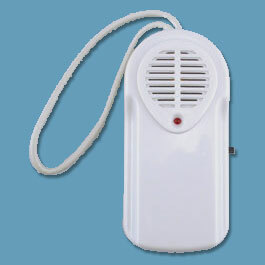 When the door knob is touched the alarm emits a loud 120 dB sound letting you know that your child is at risk of leaving. Have a warning before your child goes out the door.